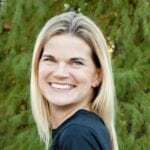 Have I told you that I am the Creative Activities Coordinator for my MOPS group (Mothers of Preschoolers)? Well I am. 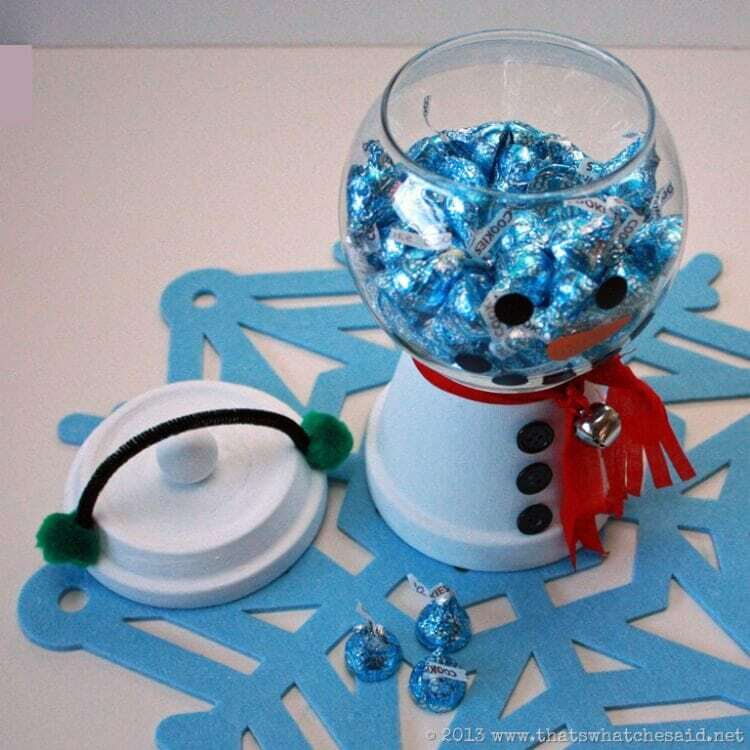 We had our craft time at our December meeting and I wanted to do something seasonal but not holiday. I wanted something everyone could keep out for more than 2 weeks but tied in with it being winter. 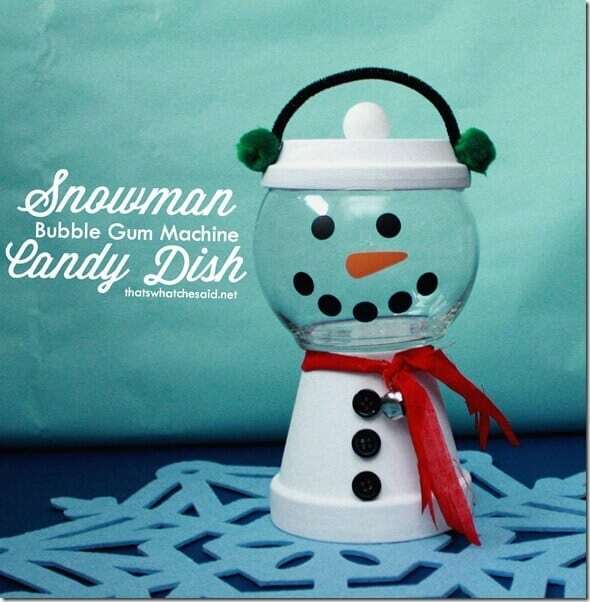 I decided on a super cute Clay Pot Snowman Candy Dish! 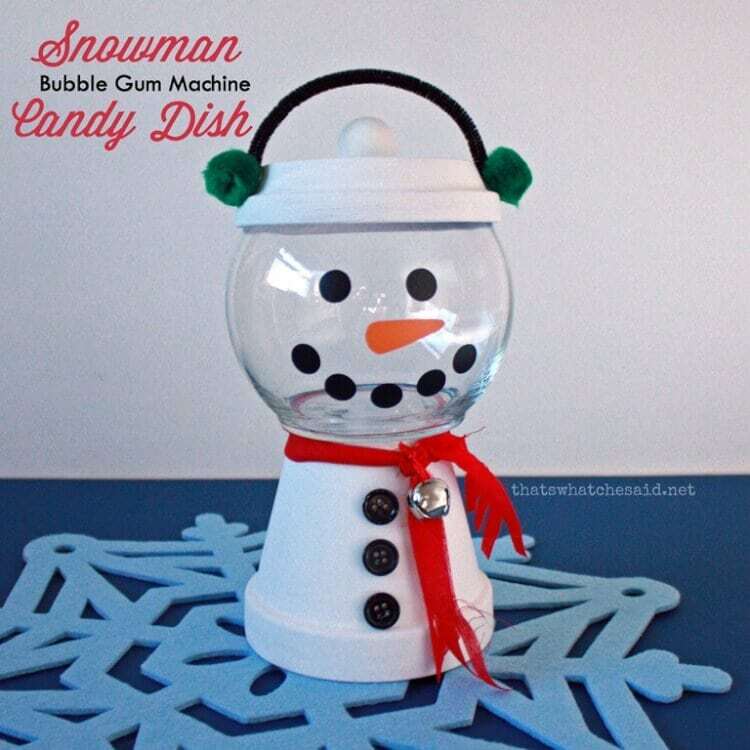 It resembles the bubble gum machines you see all over Pinterest but in our case, it is decked out as a snowman and perfect for the winter months! (If I still lived in MN then I could leave it up through JUNE because winter is so. darn. long. up there!) Anyway…I thought you would all like to make one also! I had planned this post go up a bit sooner and then the dreaded flu found its way into my soul and sucked every bit of life out of me for a week and counting so I am now trying to catch up! 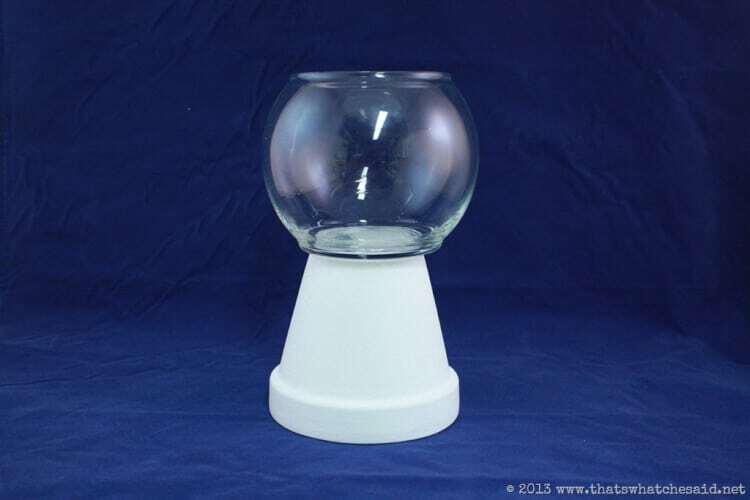 Start off by painting your pot, drip plate and wooden ball white. We used white acrylic paint however you could also spray paint this as well. I didn’t even bother removing the barcode tags because they will be covered. Once your pots are dry, you will glue the glass globe onto the bottom of the terra cotta pot. 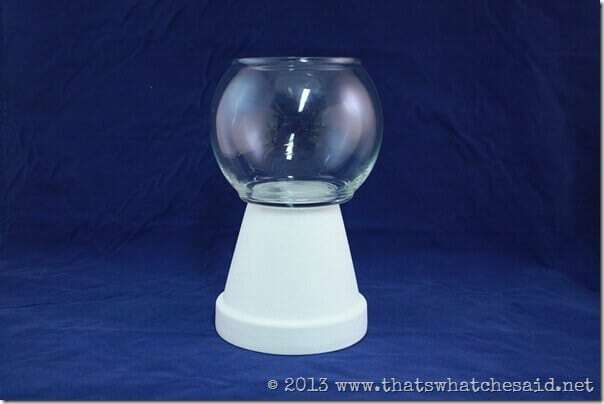 So turn the pot upside down on your work surface and then glue the glass globe right side up, onto it!. Next, turn your drip plate upside down on your work surface and glue the flat side of the wooden ball to the plate. Now the hard part is done! Just like a real snowman. Rolling the snowballs and stacking into a body is the most work! Now comes the fun part…dressing him up! I used three buttons for the body and then used some fabric scraps for a scarf. I tied a small jingle bell on to the scarf…well…just because! I glued two pom poms on the lid with a pipe cleaner to look like ear muffs! I used some black and orange vinyl for the eyes/mouth and carrot nose! You can really decorate him however you’d like! (Here you can see the lid a bit better against the blue background.) Fill him with some candy and you are set to go! *this post may contain affilate links. You can find my full disclosure here. Monday Funday with Rachel’s Features! Aw, I love him! He goes in my file of things to do! Thanks! 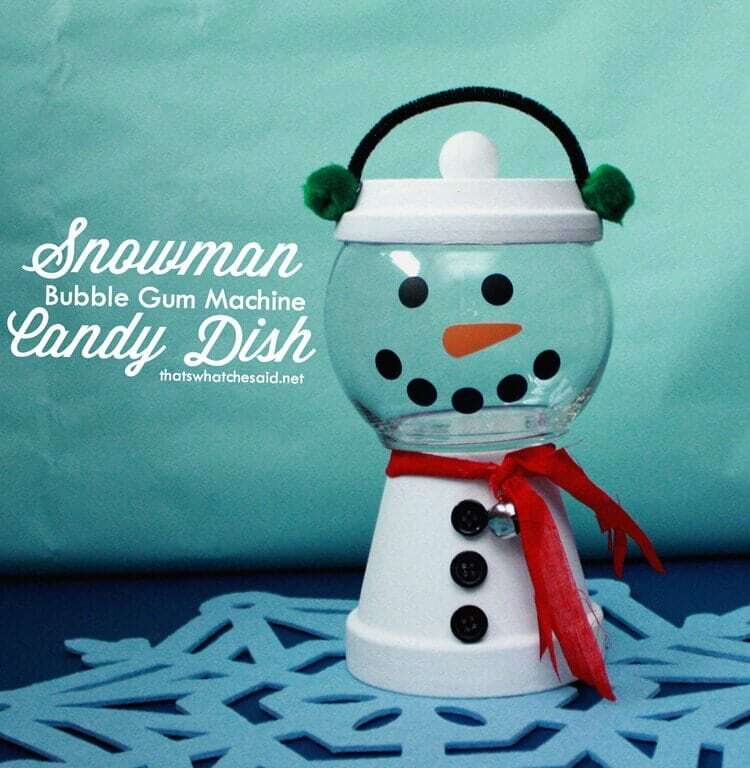 I love snowman and he is adorable!! Definatley going to make him!! Thanks Crystal! I can’t wait to make a few more! Thanks Lisa! I think so too! He turned out better than what I pictured in my head! 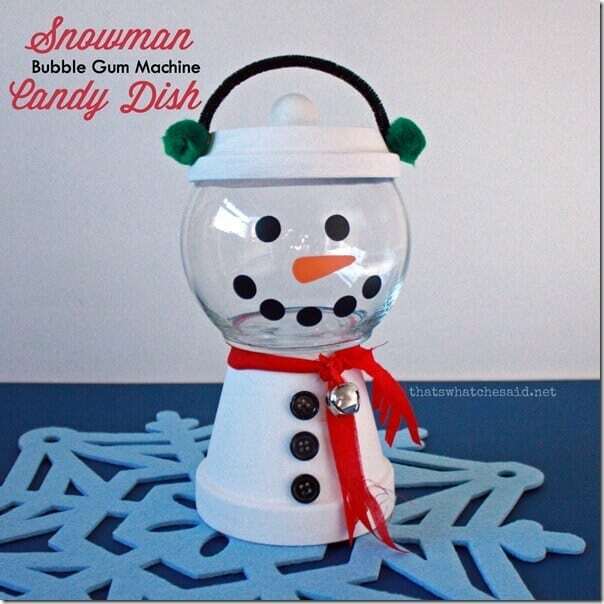 I like how you altered the bubble gum machine project into this cute snowman! Great job! I;d love it if my little one brought this home! 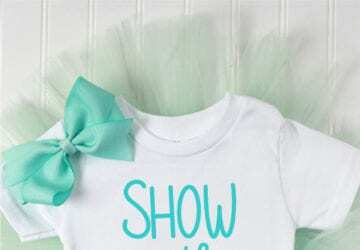 Another cute & clever idea! 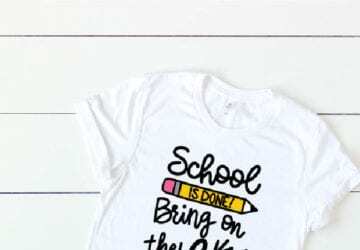 I am featuring this one at Dollar Store Mom on Monday! 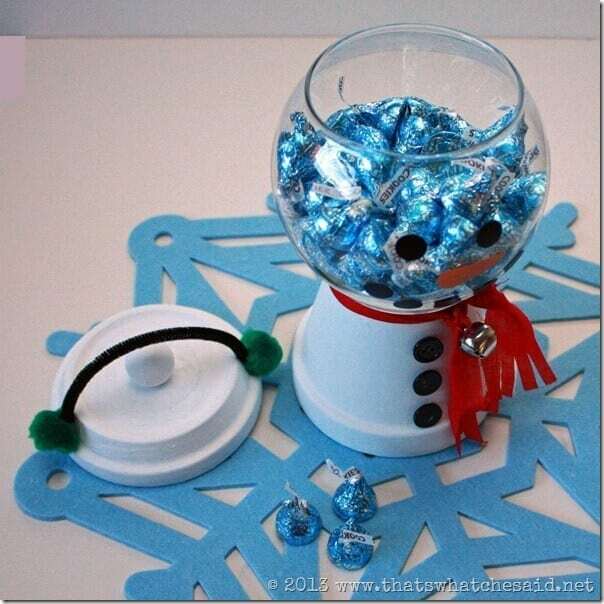 I love this snowman and have made it in my classroom as a holiday gift for the last two years. I have one problem. The globes don’t want to stay glued. What am I doing wrong? Any suggestions? I am using a glue gun. I’ve tried gluing with the bar codes still on and I’ve done it with the bar codes peeled off. It doesn’t seem to matter. I could really use some help so I can keep making these. My classes have loved these. Thanks Bonnie! Hot glue will not hold the clay to the glass. You will need a stronger permanant glue. I used E6000. I only glued a thin circle around the pot and mine is stuck there for good with that E6000 glue. Any suggestions on where I can find the vinyl? I don’t want to buy a whole bunch. Could I paint the face on? Alice, My Jo-Ann Fabric & Crafts has sheets of vinyl for less than $3. 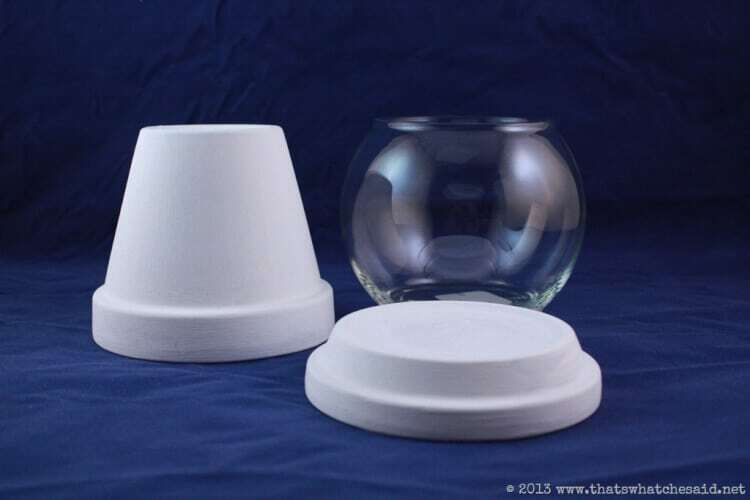 Maybe check the sizes of your glass bowl and the clay pot dish? If they are too far off in size it may wobble. Where do u buy your pots and lids. My lids look nothing like that. My are just plain round. I love the looks of yours..
Kelly it was a while ago I made these but I am almost certain it was Michael’s. I’d also check out your Home Depot or Lowe’s I believe they had these same types as well!